So, you have an opera with a frankly barbaric score and libretto. Say, Turandot. What is a violent, dangerous setting for this that doesn’t imply that Chinese society is prone to these kinds of things? I know, insects! They’re vicious, right? This is the most spectacular production I’ve seen at the Volksoper, and orchestrally one of the best as well. And the basic idea of setting Turandot with bugs is kind of nifty. Unfortunately, it’s the only idea director Renaud Doucet and designer André Barbe (the team responsible for last fall’s Rusalka) seem to have had. Sure looks cool, though! Puccini, Turandot. Volksoper Wien, 3/28/2011. Production (revival) directed by Renaud Doucet, sets by André Barbe. Conducted by Enrico Dovico with Anda-Louise Bogza (Turandot), Mario Zhang (Caláf), Melba Ramos (Liú). The production starts off rather well. We’re in some community consisting entirely of insects of various types and statuses. Some are workers, some guards, some officials, and some leaders. 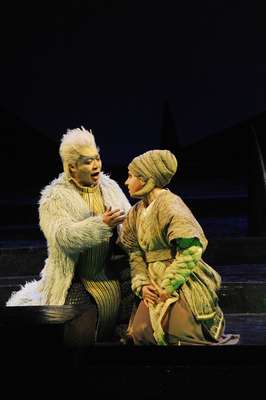 The costumes are colorful and spectacular, and the dark backdrop and dim lighting gives it a scary air. 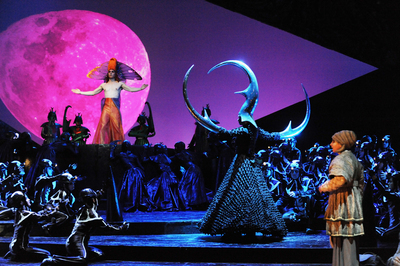 A tall black figure with enormous talons appears early in Act 1 and it seems implied that she is Turandot, but it turns out that Turandot is actually a much less interesting fuzzy white figure. The talon lady is Death or something (having some role in Prince of Persia’s execution, and later Liù’s method of suicide), but like most things in this production she exists more as a visual gesture than a dramatic one. It’s all quite intimidating and inhuman and ceremonial, and while it feels perfect for the music’s violence, the inhumanity also proves to be the production’s biggest stumbling block. Despite the visual impact of the big moments, the staging doesn’t do a very good job of telling the story and exploring the characters. I don’t think this was inevitable consequence of the buggy-ness of it all, but it’s how it turned out. The overwhelming visuals, monumental costumes, and static blocking don’t enable the singers to emerge from the atmosphere as personalities, and the concept is too static to pick up the slack. Barbe’s choreography (I assume, there is no other choreographer credited) was a weak point, as in Rusalka, and even when performed by bugs resembles Jazzercise. So despite a promising start, the production proved disappointing as it failed to develop over the course of the subsequent acts. There are many nice visual touches, though. The Volksoper orchestra, conducted by Enrico Dovico, tackled the score with enthusiasm and significant decibel count, sounding bigger and more polished than they usually do. None of the singers had the power to compete. Anda-Louise Bogza has a large though not enormous Italianate soprano with a broad vibrato and warm if sometimes spread tone. She had some exciting moments and to her credit mostly sang and did not scream, but lacks the cutting high C’s to be a truly memorable Turandot. Mario Zhang’s dark and muscular sound and stiff phrasing did little to bring life to Calaf, who I’m pretty sure now is the actual villain of the piece. Melba Ramos had a shaky start as Liu but mustered the best overall singing of the cast with a slightly covered, smoky lyric soprano and good dynamic control. Supporting roles were adequately sung, though the Emperor headed south over the course of each phrase, ending each painfully flat. 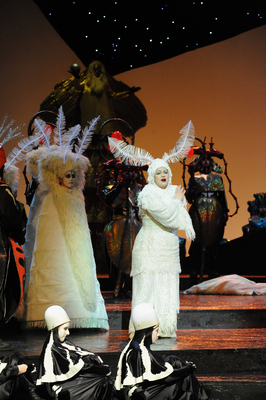 At the Volksoper, two performances remain, on April 7 and 10. You can also see a short video on their website.